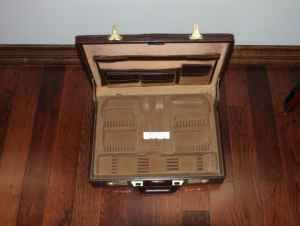 I saw your ad on craigslist for the Utensil case http://toronto.en.craigslist.ca/yrk/hsh/1475167354.html . I am not being hyperbolic when I say that that is the most useful thing I have ever seen. Think about it... as you mentioned it is "great for bring the utensils camping", I mean TOTALLY! Sometimes when I go camping I just put my utensils in a bag inside a backpack or something and then I spend the whole evening trying to sort and display them. But with this they would ALREADY be sorted and displayed. I just have to ensure that I have one hand free the whole time I am hiking to the campsites so I can carry the briefcase with my forks. SO CONVENIENT! Just to make sure everything is on the up and up though, would you mind displaying a few of your own utensils in it so I can see how it works. If you could take the picture in a camping environment that would be a bonus, because then I can imagine it as it will be used.